Is shorting that pair … really the highest probability bet you can identify out there this week? It seems you only trade binary then ? No. We’re part of that horrid bunch who offer platform features & price offerings to you boys & girls so you can punt away to your hearts content, as well as trying our best to discourage the types of low probability gambles that inevitably & very regularly transfer your money to us. you don´t work for oanda? low probability trades aren´t the problem. punting low probability gambles take a heavy toll on your psychology as well as your wallet & they’re all strong contributory factors highlighting the constant donation of cash from the average punters pockets into the ever welcoming satchels of the broker. They certainly are - or a big part of it. For the very practical, realistic reasons Cator mentions above. Also, low probability trades make it very much harder for less experienced, less professional traders to verify whether or not their trades have a genuine edge, because of the huge sample-size needed, that way, to achieve statistical significance (which inexperienced traders tend not to understand anyway, because statistics aren’t most people’s cup of tea). Low probability trades are a huge part of the reason why most people lose their money. trying our best to discourage the types of low probability gambles that inevitably & very regularly transfer your money to us. Lol - Not very often you come across a “benevolent bookie…”. Apparently all the analysts and other Experts agree with what you are implying here - That has to be a good sign - whether it is enough to outweigh that 62% short is a different question, but at the end of the day, this is just another “trade” - I’m not trying to influence others to participate and neither is @ruilima22 as far as I can tell. Pure waffle - not a constructive thought, nor a direct respose whatsoever cator. I refuse to engage any further, unless you have something to say ! lets keep this thread as a trading journal, and to discuss technical analasys. i don´t do fundamental analasys, and i prefer a good money managment to win ratio probability. but that´s my way of thinking and trading. i like the shape of those 4 last dailly candles as push´s end , and i also like that doji on w1. and it´s at a resistance level 1.2000… so it can go down. 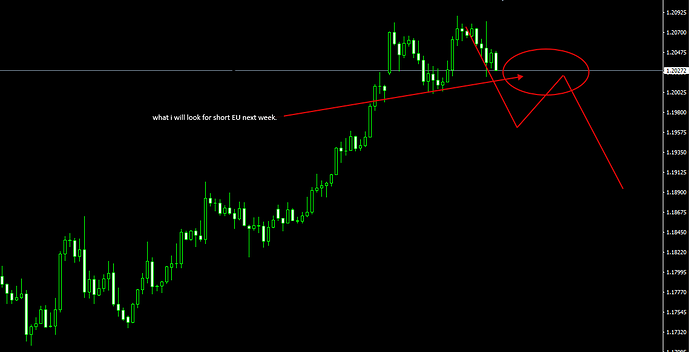 i will also be looking for shorts at audusd and nzdusd. i doubt my opinions would be welcome here my man, primarily because they would be encouraging viewers to oppose most of the bets you endorse for the reason already mentioned. i will say however you’re wise to let the picture zoom into view properly before playing your hand on one or two of these reversal punts. next week will hopefully offer more clarity, but as I suggested previously, there was far more value to be had elsewhere last week if you were eager to slap a few quid down, as there will be next week, than punching yourself into a coma punting reversal set ups. but as I said before, all the very best of luck to you. Certainly the Eurodollar bet looks pretty positive. A first test of the previous hghs and a potential retest of the 1.1554 level to follow. I wouldn’t normally advocate 2 bets on the same underlying instrument because the potential effect of the dollar continuing to show weakness could be damaging to the account. However the potential to form a nice trading channel for a few iterations is very tempting. I’ll see how I feel about making an exception and joining you in that one later. These two pairs do represent an opportunity which seldom occurs whilst one is actually looking ! it´s a possibility. but i think it may go to 1.900 level and then it will break the 1.200 to continue it´s rising. Especially when it is by no means certain that 1.200 will not hold as support ! [Edit - incidentally, when IG are saying “62% short interest” - I’m assuming that is the monetary value - so it could be hundreds or thousnads of small bets or a few big bets - is that right ? SO are we saying that 62% are betting 10 pence each and 38% betting £100 each - yet that would still show as "62% short ? " Sorry @ruilima22 - I thought from a post a few back, that you had access to the “broker side” information - when you were talking about “limit orders” - No problem mate, just that It could make a big difference to probabilities as to whether the “short side” are numerical or cash valiue !